Deep Set Soil Acidifier | High Ground, Inc. Finally! A company dedicated to providing alternatives to toxic chemicals and materials. Deep Set™ soil acidifier lowers the pH of your soil around acid-loving plants shrubs and trees using food grade ingredients, without using metals that accumulate in the soil, or unsustainably harvested mosses or barks. Deep Set is recommended for use as an additive to mulches and compost before application to soil as a slow release acidifier, rather than as a direct pour into soil surfaces. 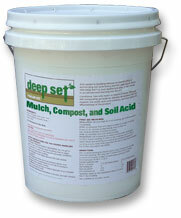 Deep Set Soil Acidifier is designed for professional use, and needs to be handled with care and caution. 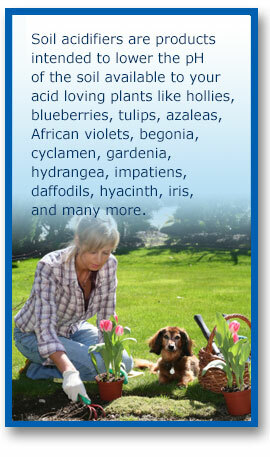 Deep Set Light Sustainable Acid Additive is our home and garden consumer product. The concentration of the active ingredient is slightly above that of household dietary vinegar, and is designed to be handled by the casual user. Deep Set products will kill plants and grasses that do not require low pH, and the products should not be used on or near those plants. Avoid contact with direct use, or the suggested use of incorporation into mulch.